The Language & Communication research group, part of the Utrecht Institute of Linguistics OTS, aims to understand how language is used to get things done in the real world, as well as how such actual, goal-oriented language use can be made more effective, particularly in the communication between institutions and individuals. 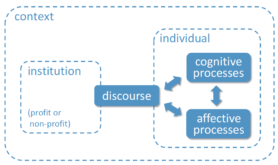 We analyze the nature of the texts or conversations involved, the cognitive and affective processes they elicit in the language user, and the resulting representations and/or behavior. Group members use a wide range of methods from linguistics, psychology and cognitive (neuro)science, and conduct their research in the laboratory as well as in real-life communicative arena’s, the latter often in collaboration with societal partners. Check out our self-assessment reportover the years 2012-2017 (13 pages), where you can find much more information about our profile, research ambitions, projects, and results; see L&Cgroup-publications2012_2017 for the associated list of publications. Explore the options we offer for consultancy and/or research collaboration with societal partners, via the UiL OTS wide UCCO website (Utrechts Centrum voor Communicatieonderzoek; in Dutch; site will be available soon, see this page in the meantime), or by contacting our UCCO coordinator Daniel Janssen. Directly get in touch with one of our specific researchers, via their personal webpages. Ask the research group’s coordinator Jos van Berkum(easiest to reach by email). Check out our blog (will follow soon!). Note: we also have thiswebpage, but the one you’re on now is the one we can most easily edit and expand ourselves, so best start here… If you see anything odd (e.g. a dead link), please contact the group coordinator.